Sometimes you need a vacation when you get home from a vacation. I’ve been playing catch up ever since we got back from California. My days have been filled with answering e-mails, laundry, chores, grocery shopping, blog work, and trying to find ways to use our rhubarb. Our four plants exploded while we were on vacation. I don’t want my precious rhubarb to go to waste so I have been making rhubarb recipes like mad. One of my new favorite rhubarb recipes is this Honey Roasted Rhubarb. This recipe is super simple to make. There are only four ingredients-rhubarb, honey, orange zest, and fresh orange juice. That is it! 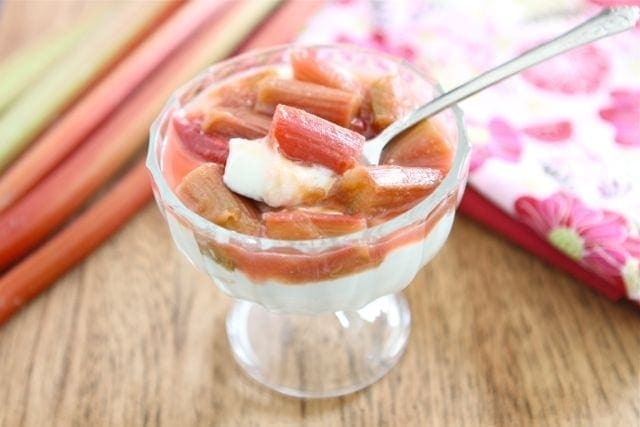 I’ve been eating Honey Roasted Rhubarb with my plain Greek yogurt every morning. It is so good! You can also spoon the Honey Roasted Rhubarb over ice cream for dessert. The sweet honey balances out the tart rhubarb while the orange juice and zest gives it a nice refreshing kick. The Honey Roasted Rhubarb is great served warm or chilled. It will keep in the refrigerator for about four days. I still have some in the fridge and I think it will make a great topping for pancakes, waffles, or French toast this weekend. I can’t wait for breakfast! This simple rhubarb recipe is great for spring when rhubarb is in season. 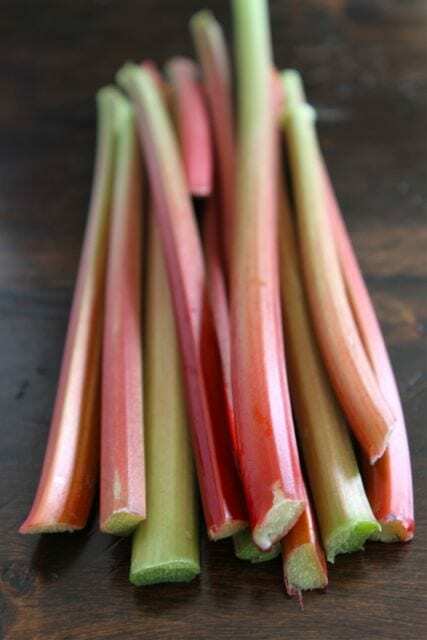 Place the rhubarb in a large bowl. Add the orange zest, orange juice, and honey. Stir until rhubarb is well coated. Place rhubarb in a single layer on a large baking sheet. Roast for 25-30 minutes or until rhubarb is tender, stirring once. Serve roasted rhubarb with yogurt, ice cream, pancakes, waffles, French toast, etc. Our neighbors growing up had soooo much rhubarb certain times of the year and they’d give it to us. Too bad I never had it prepared this way…sounds amazing! Mmm anything rhubarb is good to me! Thank you, thank you, thank you for posting this! I’ve been wanting to make something with all the gorgeous rhubarb I keep finding at the farmer’s market, but I only know how to cook rhubarb with strawberries (and strawberry season hasn’t started here yet.) I’ll be making some of this this weekend for sure! What a simple but great idea. I can imagine this with yogurt and oats. Yum! I don’t eat much rhubarb, but we do have a ton of honey on hand. Looks good and I can only imagine how great it would be over yogurt! Oh yum! I love rhubarb, I always get to eat it all b/c my husband doesn’t like it. You can freeze rhubarb so that it’s availble to you all year. I’ve never personally done it, but I have had dishes made with it. I canot see the recipe. I see the photos and the preamle to it, then the comments. Where do I find the recipe? Whitney, I freeze rhubarb every year.You just cut it into the size pieces used in your favourite recipes and pop it in the freezer. Nothing fancy to do. I use it in muffins, crumbles, pies and of course, rhubarb sauce – which I mix with plain yogurt; make smoothies, etc. Yum! I love rhubarb but have yet to try it roasted! Definitely adding this to my collection of rhubarb recipes! I have rhubarb, and I didn’t know how or what to make with it. I’m going to try your recipe, it sounds amazing. OK, you have posted so many rhubarb recipes and I have never tried it before! That’s it! I have GOT to try it! This looks great! So fun!! I just tried and cooked with rhubarb for the first time last week and love it. It’s pretty expensive around here even though it comes from local farms but my cousin loaded me up with a DRAWER full of it. 🙂 I just made a galette the other day [first time for that too] and am so excited. Definitely love sweetening it with honey. I’m going to check out your recipes so I can use the rest of it! I love roasted rhubarb and this time of year! This looks like such a sweet treat. I love the idea of pairing it with Greek yogurt. Mmm! 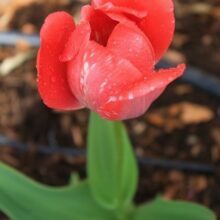 It’s so great that you have rhubarb plants in your yard! We didn’t grow rhubarb where I grew up, so the first time I saw it, I thought it was red celery. I avoided it just like I avoided celery, but then someone educated me! 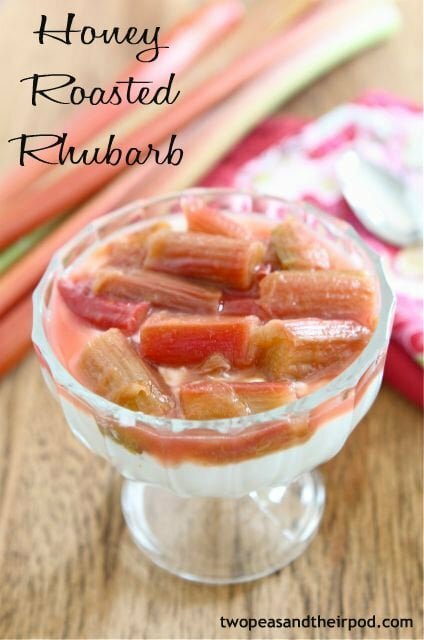 I love all the recipes you have for rhubarb, and this looks lovely and simple. I have never had rhubarb prepared like this before-looks and sounds absolutely delicious! What a great collection of recipes! I’ve got plants growing now, brand new. Can’t wait to use them up next year! I love roasted rhubarb and yogurt — how I envy you that you have a whole garden’s worth! 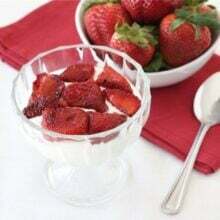 Such a lovely, elegant and easy summer dessert! i’ve never had rhubar but this looks delicious! It’s amazing how much deliciousness happens after rhubarb, orange, and honey are combined! This would make for a nice crepe filling! I would love to make your recipe. I know you said it was simple. You didn’t post the recipe rather pointed us to another site but I can’t find it. I have visited it several times and triple checked. What am I missing? Your post sounds delicious! Here is the link: http://www.zupas.com/2012/05/honey-roasted-rhubarb/ It is working for me! Can’t wait for more rhubarb recipes. I’ve always been intimidated by rhubarb. Thanks for this simple recipe. Sounds fantastic! i don’t think i’ve ever had rhubarb without strawberries! Too easy of a recipe to not try it! Thanks!! I can’t believe you grow your own rhubarb, amazing! Such a delicious way to prepare rhubarb! I try to cook with rhubarb as much as humanly possible while it’s in season because it won’t be around for long! Love the sound of this…it would be a great way to dress up some yogurt in the morning! Love the idea of honey roasting to bring out the sweetness. 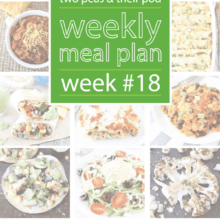 This recipe is truly easy to make and very delicious too! I’m sad to say I’ve never tried it, but this makes me want to! That looks so wonderful! And I’m always looking for more great rhubarb recipes! Thanks! This looks great Maria! So simple and colorful! Can’t wait to try! Sad day!! I found this recipe on pinterest…. but I can’t get it to link to your guest post… I so wanted to try it on banana pancakes… :-/ looks SO good!! I updated the link! Sorry about that! I did something a bit different with this recipe. Instead of using it as a topping, I used it to make the actual rhubarb ice cream! It has to be one of my favourite creations 🙂 I did adjust ratios a bit (more honey and some salt) but it all worked out in the end.